Love your Garden with Alan Titchmarsh is a popular garden makeover series featured on ITV. It just so happens to be one of our favourite shows and we were delighted when they asked us for one of our buildings to help out their current client. In Episode 2 of the series Alan and his team of experts surprised Shelia and her husband from Moorehead, Somerset. Last year the couple were one of those unlucky few whose homes and gardens were destroyed by the flooding. Shelia said: "It was like a tsunami had hit the garden. It was devastating; my garden was my pride and joy." Alan and the team surprised Shelia and her husband and vowed to transform it into a beautiful retreat. We were really excited to see the final garden makeover when it launched. The team decided to go for an American New England theme for the garden with white picket fences, large white arches, a potting shed and a wooden greenhouse. We love the theme and the complementing bright pink, purple and blue flowers look fantastic. 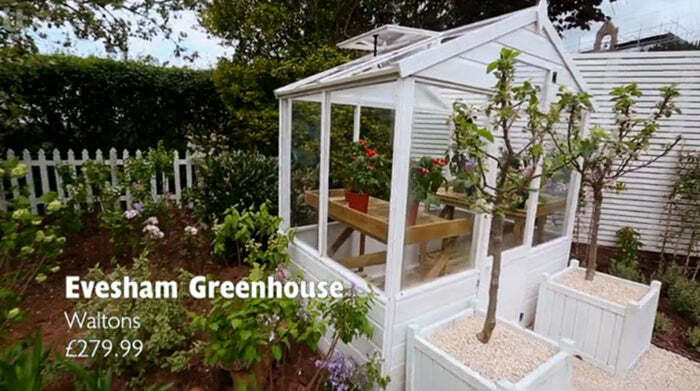 Titchmarsh and his team used our 4 x 6 Waltons Evesham Wooden Greenhouse n Shelia's garden because of its compact size and because they wanted to paint it to match the theme. 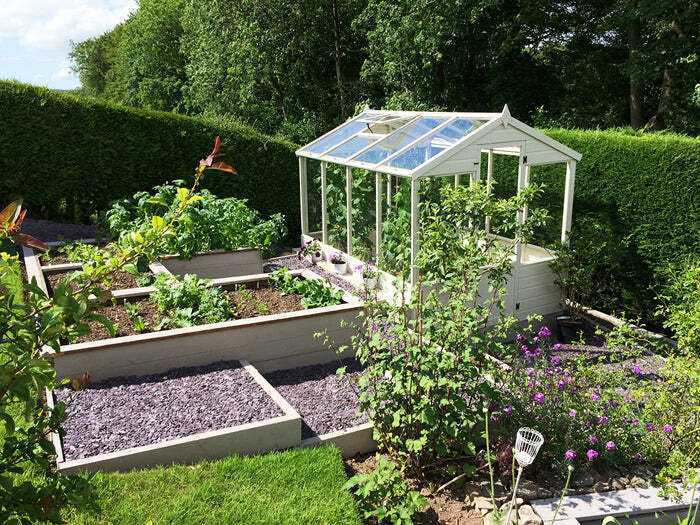 Titchmarsh said:” Sheila wanted a greenhouse to grow tomatoes in and the team had the challenge of finding one which not only would match the white timberNew England theme, but also one which was small. We requested white paintwork, although treated wood is also available. The tilting windows are pretty and also provide ventilation and the door is hinged. It is clad in 12mm tongue & groove cladding, is UV protected and has shatterproof styrene glazing." Our customer Tim also bought the Waltons wooden greenhouses. He decorated it using Farrow and Ball paint to match in with his garden. We think it looks fantastic. Tim said:" We wanted it to blend in with the rest of the garden so painted it up in Farrow & Ball paints, and built some terracing around it for other planters; we love how it came out and it is now the focal point in that area of the garden!
" Currently it's full of cucumbers, with aubergines and bell peppers are on the way; it’s so fabulously practical too!" Waltons Evesham 4'x 6' wooden greenhouse is a great building. It is made from 12mm tongue and groove timber which makes it a very strong and durable structure, it also comes in a range of sizes to suit the needs of the garden. 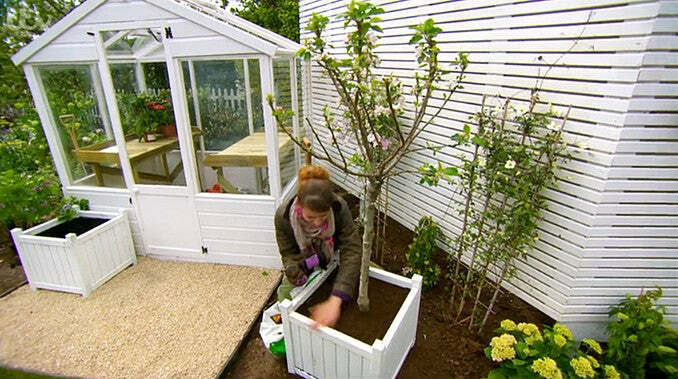 Wooden greenhouses are more customisable than polycarbonate because they can be treated and painted for your garden. Waltons Greenhouse Featured on ITV’s Love your Garden by Waltons Web Ltd is licensed under a Creative Commons Attribution-NonCommercial-NoDerivatives 4.0 International License. Based on a work at https://www.waltons.co.uk/blog.